﻿ Disclaimer - 1E1981 Sports Shop -- Online Shopping Global Delivery. Welcome to e1981.com. e1981 maintains the site for informational purposes and as a service to the Site´s visitors, subject to the following terms and conditions. If you use the Site, you accept the Disclaimer. If you do not agree, then you may not use the Site. e1981 reserves the right to modify Site´s content without prior notice. Your use of the Site is at your own risk. Any products published on the Site may be the subject of intellectual property rights reserved by suppliers and are not licensed hereunder. You must make your own determination of the suitability and completeness for your own use. e1981 makes no representation for any product with intellectual property problems. Once products sold online suffer infringement claims, suppliers will take responsibility for it without excuse. e1981 will not interfere. All measures and conversions of metric/imperial values are approximate. all content, information, services and products provided on the site are provided for informational purposes only and on an "as is" basis without warranty of any kind, either express or implied. e1981 disclaim all warranties, express or implied including, without limitation, those of merchantability, fitness for a particular purpose and noninfringement. e1981 further disclaims any liability in connection with the site or the information, content, services and products provided in the site. you are solely responsible for the appropriateness of the site, its content, and the information, products and services offered by e1981 on the site for your intended application and use. 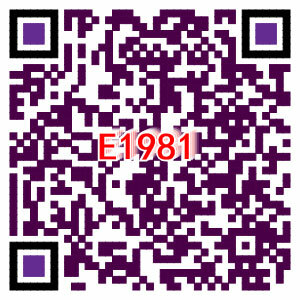 e1981 does not warrant that the site, its content, or the products and services it offers on the site meet your requirements. in no event will e1981 be liable for any direct, indirect, special, consequential, incidental, or punitive damages for any reason whatsoever connected with the use of the site. e1981 assumes no liability and does not warrant that any product information or content contained in the site is accurate, current, reliable, complete or error-free.